In waterfront communities all over the Gulf of Maine a tug of war is happening between big business and a rich fishing history. PORTLAND, Maine and GLOUCESTER, Mass. (NEWS CENTER Maine) -- Everyone has a morning routine. Perhaps though, none like Joanne Arnold's. It's 7:00 on a Tuesday morning in later October. Sunrise is not for another 13 minutes. 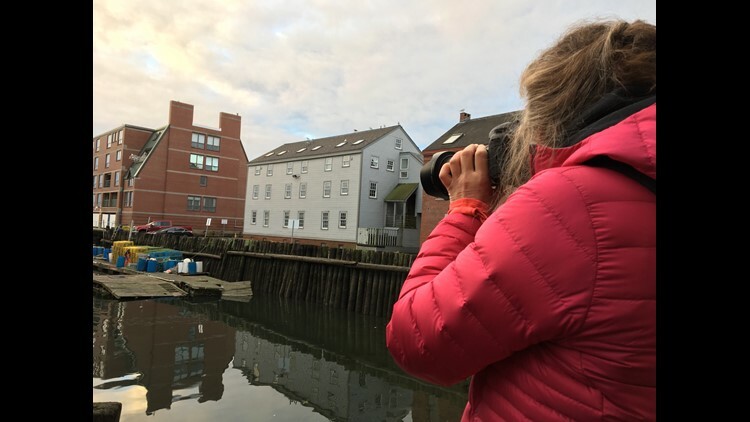 On a wharf off Portland's Commercial Street you'll find photographer, Joanne Arnold, among the homeless walking by, the trucks backing in, and fishermen loading their boats. “I needed to do something that was really different to explore my world," said Arnold, who had a camera in her hands and was bundled in a heavy, bright pink coat. "I felt stuck and so this was an opportunity to experience the world as if it were brand new." Joanne Arnold captures photos at sunrise of Willis Spear's fishing boat heading out for the day. Ten years ago, Arnold started taking photos of the Portland waterfront at the same time everyday: sunrise. She says it's become her practice and the routine she adopted a decade ago requires no discipline. She started by taking pictures of buoys and lobster traps. As she became less shy and more familiar with the fishermen, her photos became a way to document. "It was who inhabited the landscape that created a connection to my community that was unexpected and profound and I value,” she said. Arnold has gotten to know many fishermen. She laughs with them when they make jokes and she lends an ear when they voice frustrations. But it's those feelings of concern that she has begun to harbor too. An appreciation the fishermen don't feel, they say, as more and more of their workspace is developed. "There is a lot of activity in the morning when people are still sound asleep in bed," said Willis Spear, a fisherman for more than 50 years. Willis appeared in a video produced by a man named Tom Bell at the request of the Save the Working Waterfront Group. It will be posted on social media in the near future. A date has yet to be determined. The video features fishermen who are voicing their fears that they are losing precious room to work on the wharves, as plans for condos and hotels continue to roll out. Waterfronts all over the Gulf of Maine are facing the same problem. On one hand, tourism means big business. On the other hand, fishermen feel like they're being pushed aside. Is there a way to ensure everyone can enjoy the waterfront? It's a debate that's decades in the making. Needelman says Portland's wharves are small constrained places with lots of activity and will function best when people work together. He is one of several people who attend regular Waterfront Alliance meetings, when city officials, business owners, developers and fishermen meet to discuss the fate of the finger wharves, which are privately owned. 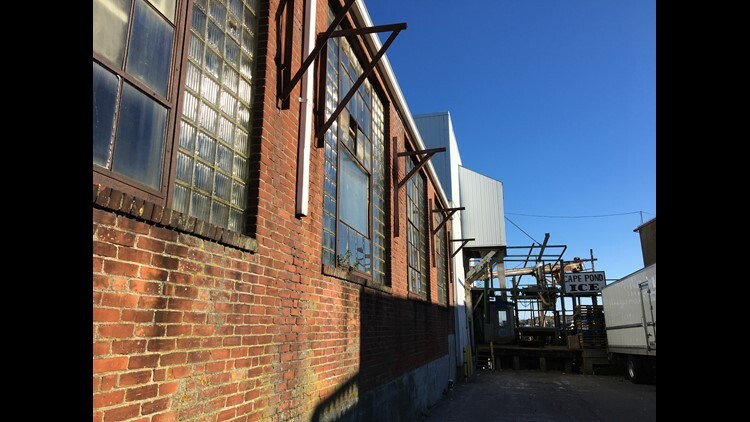 "If we’re going to pay taxes and take care of this place we need to generate revenue,” said Charlie Poole, the President and Chief Operator of Proprietors of Union Wharf. Poole and Needelman say they hear the concerns of the fishermen, particularly concerning the congestion on Commercial Street but there needs to be a balance where non-marine economic development benefits the piers. In Portland's latest Comprehensive Plan, words like "promote," "protect," and "balance" are words frequently used to address waterfront challenges. But fishermen say they're not reassured by it. A group of fishermen and supporters of the fishing industry meet weekly at Becky's Diner. They say what makes Portland's waterfront unique to other work waterfronts on the East Coast or West Coast is that it's a safe harbor with deep water. "That’s pretty hard to come up with," said John Bisnette, another fisherman. Bill Coppersmith brings up the example of the condos built on Chandler's Wharf, formerly known as Central Wharf. He says fishermen were promised that they would still be able to work at the space. He says that promise was broken. Not long after the construction of the condos on Chandler's Wharf, in 1987, a referendum restricted redevelopment for non-marine use. In 2010, Portland City Council relaxed those restrictions and amended the zoning. Between now and then, the city has seen more plans roll out for condos, hotels and offices like a mixed-used development on Union Wharf and a planned boutique hotel at the site of Portland Lobster Company. As of late October, Portland residents introduced another referendum, similar to the one in 1987 designed to protect the working space of fishermen. If the referendum gets enough signatures from registered voters, the plan will go before the City Council. Councilors will decide what happens from there. However, while Portland is Maine's largest city, it isn't the only waterfront community in the Pine Tree State tasked with finding a balance. "With very limited access to the 3,500 miles of coastline in Maine we are proud and fortunate to be able to work on behalf of our community, to preserve this important part of our heritage so that people will be able to continue to work on the water for many years to come." One course of action they are taking right now is acquiring ownership of the Sea Pier: the site of the largest lobster buying station on the East side of Boothbay Harbor. They say a purchase and sales agreement was recently signed and ownership will transfer February 1st. It was the result of generous donations from anonymous individuals and the desire of the Sea Pier's owner, Douglass Carter, to keep Boothbay Harbor a working waterfront. The Boothbay Region Maritime Foundation is also starting to fundraise to rebuild a 67 x 140 ft. pier on the site. Curious to know if Portland and the Boothbay Region are the only places faced with a challenge like this, we went on a road trip to Gloucester, Massachusetts another community rich with fishing history. That's where we met Scott Memhard. He wears two hats in his city. He serves on the city council and he is the owner and president of Cape Pond Ice Company which supplies ice to fishermen from all over New England, including Portland, Maine. “If there’s no working waterfront then there’s nothing for people to come and see,” he said. In recent years he's had to find a new way to make money. Special effect ice from his factory will be part of a remake of Pretty Woman which is currently filming in Harvard, Massachusetts. Cape Pond Ice also sells ice luges and dry-ice, which was popular the day of our visit, Halloween. Memhard says times are changing in Gloucester, too. Similar to what's happening in Portland, but on a smaller scale. He says the wharf his company is on has become expensive to maintain, so he's brought on a partner to invest. Ideally, the ice company will remain, but in half the space. The other half will become some sort of revenue generating business like a brewery or restaurant. But Memhard says getting to that point will be a challenge. For one, the building is not up to new codes for flood zones. The building itself must be several feet higher than where it sits now. Several years ago, a show called Wicked Tuna started reeling in viewers all over the country and the world. Memhard says tourists visit Gloucester just to get a selfie with the cast. And he says while it hasn't been that significant it has been a welcomed boost to the local economy. The National Geographic show takes viewers into the lives of the tuna fishermen of Gloucester. In June of 2018, it celebrated its 100th episode. Back at home in Portland, Maine, Joanne Arnold hopes her neighbors get to know local fishermen the way she knows them.